Dolphins rookie free agent’s credentials rivaled, if not surpassed, those of the 10 centers selected in this year’s draft. Tyler Larsen didn't have to look very far for inspiration when it comes to his dream of playing in the NFL. His older brother Cody was in the exact same position Tyler currently finds himself in before eventually landing a spot with the Baltimore Ravens as an undrafted rookie free agent. Having gone through the draft process himself a year ago, Cody was able to help Tyler this year in terms of preparation and also as far as telling him what to expect. Whereas Cody was a defensive lineman in college, Tyler ended up on the offensive line after making the most to offense during high school. Tyler suggests the different choices came down to personality. Tyler Larsen more than caught on to offense, he thrived as an offensive lineman and became one of the best in the country. While Cody played at FCS school Southern Utah, Tyler performed at FBS Utah State, the same school that produced Dolphins 2013 third-round pick Will Davis . Tyler Larsen was nothing short of dominant at Utah State, earning first-team all-conference honors the last three seasons — twice in the WAC and once in the Mountain West after the Aggies switched conferences. Larsen even earned second-team All-American honors from USA Today last year and was one of six finalists for the Rimington Trophy, given to the top center in college football. 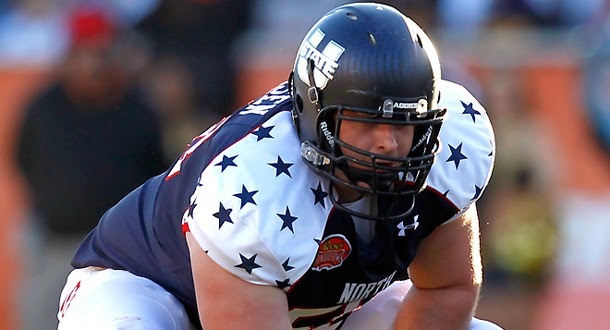 He then turned in an impressive performance at the Senior Bowl, where he was one of the rare interior offensive linemen who wasn't dominated in practice by defensive tackle Aaron Donald, the eventual 13th overall selection in the 2014 draft. Bottom line: Larsen’s credentials rivaled, if not surpassed, those of the 10 centers selected in this year’s draft. Last year was great all around for Larsen, who got married to Utah State softball player Samantha Miller and then proceeded to start all 14 games in the fall, extending his career school record to 52 consecutive starts. One of those 52 starts came against his brother, who is three years older but only one year ahead in his football career after a two-year church mission. Utah State faced Southern Utah in the 2012 season opener, with Tyler leaving with a 34-3 victory. “That was a really fun experience,” Tyler said. “I don’t think it will ever happen again. But I took the most out of it, my team won, so I’m happy with it. As fate would have it, the Dolphins are scheduled to face the Baltimore Ravens during the 2014 season, but a head-to-head rematch isn’t likely to happen because Tyler says his brother, who spent his entire rookie season on the practice squad, is being moved to the offensive line. So now it’s Tyler who’s helping his brother instead of the other way around.